Please click the "Always trust content from this publisher." box and click the "Run" button. Pepperdine’s eSign will automate and streamline the document signing process for contracts and internal forms for all Pepperdine faculty and staff. What has traditionally taken days and sometimes weeks to get a document signed has now been reduced to minutes. Simply Send, Sign, and Save! Legally and securely send documents for signatures online as easy as sending an email. Conveniently sign documents using any web browser or device, anywhere and anytime. Automatically store your documents securely within Nolij. Always notify your recipients prior to sending a document to be e-signed. 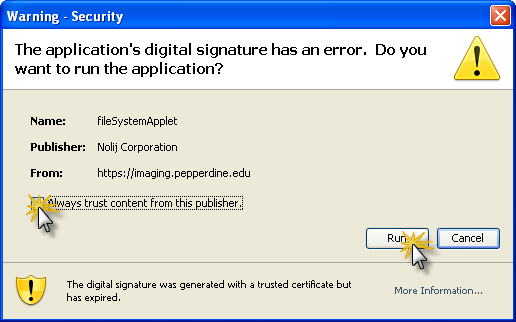 Documents must be signed entirely with digital signatures or wet signatues. Not both. Click here to find the FAQ. Need help? Please email appdev@pepperdine.edu to get help.